This pendent is a very simple but clean design, which incorporates 3 stones. The top stone is a 3mm round brilliant cut diamond. 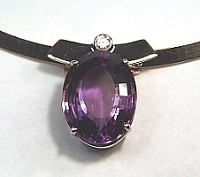 The next stone is a 3.5mm emerald, and lastly a 4mm amethyst. 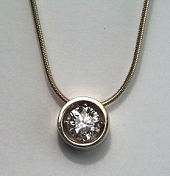 This necklace was custom built, made from 14kt white gold. 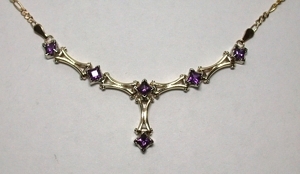 It has 6 amethyst stones that are princess cut. Set in a custom 14KY double heart pendent and 14KY Rope chain. 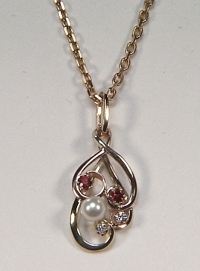 This pendent has one 4mm Pearl, two diamonds .02ct(1.7mm), and two 2mm garnet stones. Set in a 14KY hand made mounting on a 14KY Marchisio chain. 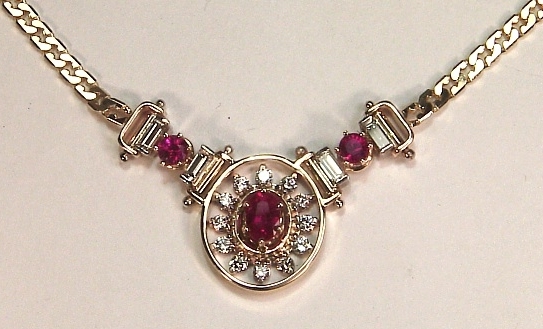 The piece is made using one .63ct oval ruby (6x4mm), two .20ct round rubies (3.5mm), four .08ct diamond baguettes (4 x 1.5mm) and twelve .03ct diamond melee (2mm). Enlarged View. 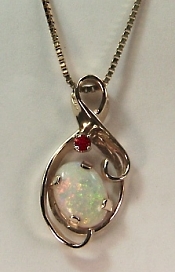 1.6ct oval opal (11 x 9mm) set in a 14kt yellow gold, hand made mounting with 3mm ruby. 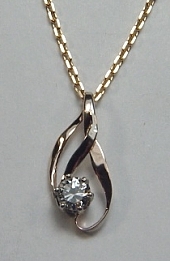 Pendant shown on a 14kt yellow gold box chain. Piece measures 1 " from top to bottom. 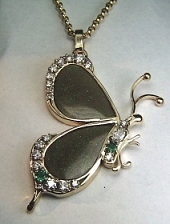 Visit our In Stock Pendants for other ready to ship pendants page. Simple but elegant way to display a single stone. 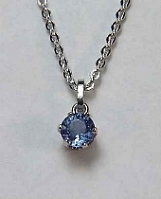 5.5mm round Celyon sapphire (.85ct) is set in a 6 prong head. 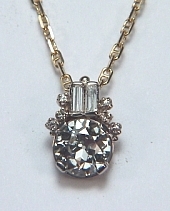 Shown on a 14kt white gold cable link chain. 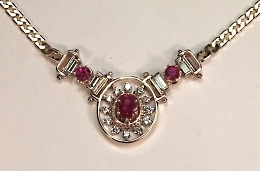 Visit our In Stock Gemstones Page for other ideas. 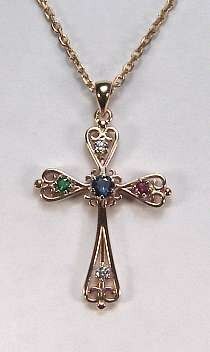 14kt yellow gold cross approx. 1.5" set with center sapphire 1/8ct. 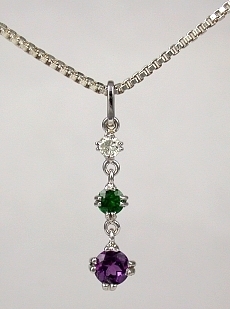 (3.5mm) an emerald, ruby and two diamonds 1/12th ct each (2.5mm). Shown here on a 22" cable link chain. This Cross makes a great Christmas or Mothers Day present. 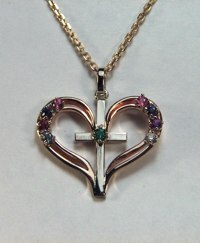 14kt yellow gold doubled heart and 14Kt white gold cross accented with children's birthstones, approx. 1" in size shown here on a 20" cable link chain. 14kt yellow gold doubled letter 'V'. 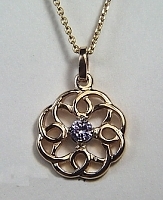 Shown in 3/4" size on a 14kt yellow gold cable link chain. This makes a great holiday gift for Mom or Grandma. Their initial or the initial of a loved one. Please call for quote with your families birthstones. Visit our Custom Monograms Page for other ideas. 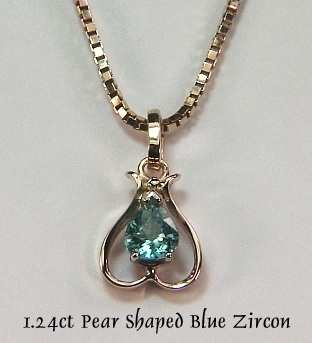 Custom pendant made with a 1.24ct fancy pear shaped blue zircon set in a 14kt yellow gold hand made mounting. Shown on a 14kt yellow gold box link chain. Enlarged view. Set with a center European cut diamond, two straight baguettes and size diamond melee. Shown on a 14KY anchor link chain. Hand made butterfly in 14kt yellow gold. The wings are made from opal and the body is adorned with diamonds and emeralds. 14kt rose, white and yellow gold flow around a .62ct round brilliant cut diamond. We will gladly sketch a design for your diamond or gemstone. 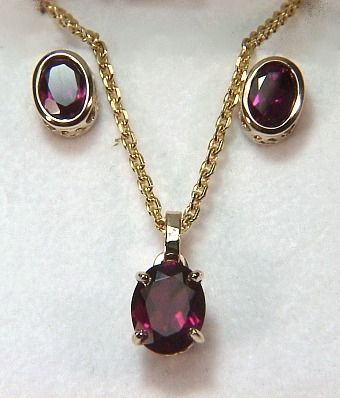 Set with 10 diamonds and 10 rubies (stone size .03ct each). 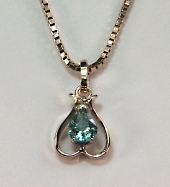 Most any combination of .03ct gemstones may be set in this style pendant. Also available in all diamonds (approximate .60ct total weight SI1 clarity with H color) . 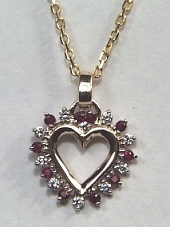 Visit our Heart Jewelry collection for PRICING and other ideas. Available in any metal with most any 4mm round stone. 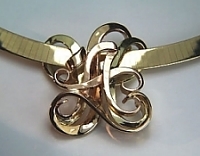 Visit our Custom Celtic site for PRICING and other knot work ideas. 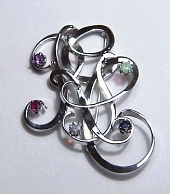 Visit our In Stock Pendants for other ready to ship pendants! page. Many items shown here were created for a specific customer and while we will gladly create something similar, it will not be identical, as all our product is hand made. Since we hand fabricate our mountings we are able to accommodate most any size and shape stone. Visit our Custom Monogram site for PRICING and other ideas. 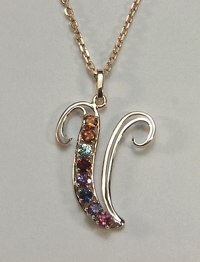 14kt white gold broach with the letters 'R G C' set with 5 gemstones (3.5mm). 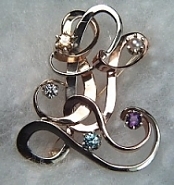 Pins can be made with one to four initials, in single or multi-color gold. We will use either genuine or synthetic stones. 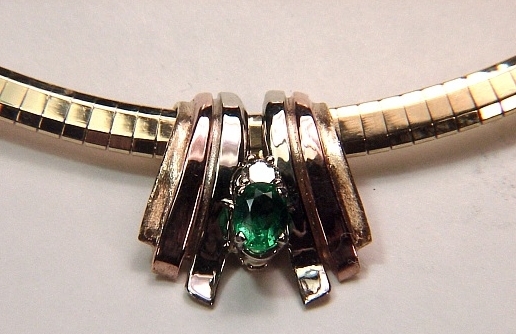 .70ct oval Columbian emerald and .15ct round diamond set in a hand made tri-color gold slide. 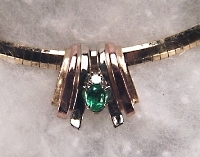 The emerald is flanked by 14kt white, then rose and on the outside yellow gold. Shown on a 14kt yellow gold omega chain. Enlarged View. Shown on a 14kt yellow gold omega chain. Visit our Custom Monogram Jewelry site for other ideas. 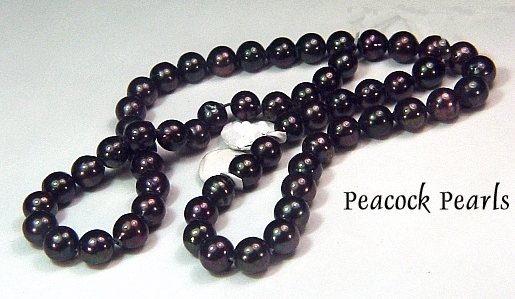 Unstrung hank of 6.5mm iridescent peacock pearls. 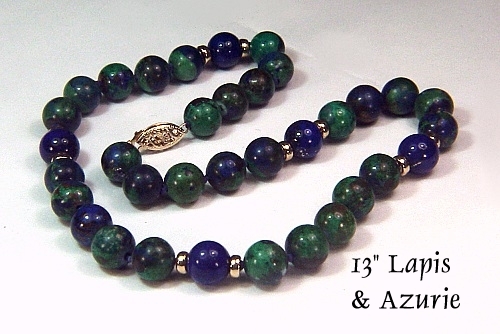 These will be strung on black silk cord with knots to any length between 16" and 18" with a 14KT clasp. 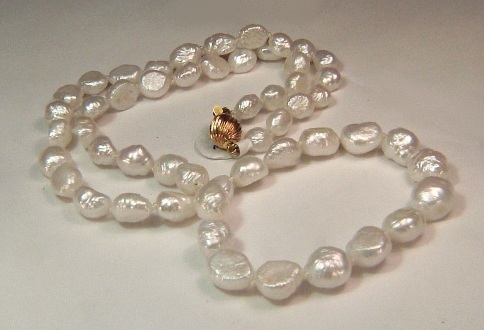 21" strand of 7mm fresh water pearls with 14KY ball clasp. 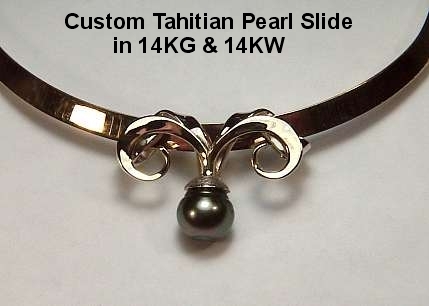 7" strand of Japanese Biwa pearls with 14KY clasp. 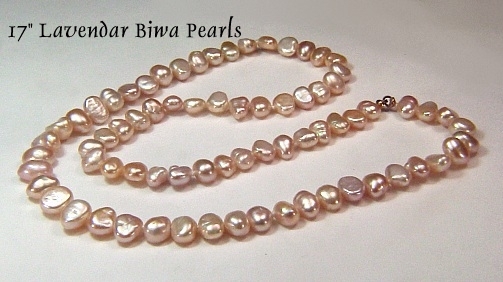 The pearls measure 6mm across and go well with pink, lavender and even peach tones!